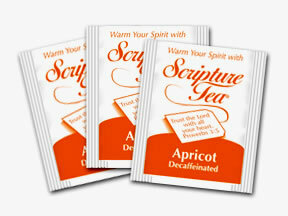 Enjoy a cup of sweet, juicy, delicious apricots in this fine blend of tea. Superb, luxurious taste that you won’t find in any other Tea. In addition to Personal Use, Scripture Tea is ideal for: Church functions, group teas, welcome packets, goodie bags, wedding & shower favors, house gifts, hospital gifts, holiday gifts, gift baskets, our military and especially enjoyed by the elderly and shut-ins.